Media: Soft Cover, 96 pages of text. Advantages: A chronological account of Luftwaffe torpedo operations. Disadvantages: Lack of bibliography and discussion of the aircraft. 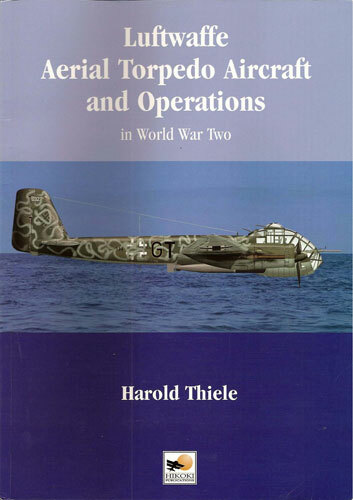 The book under review is entitled "Luftwaffe Aerial Torpedo Aircraft and Operations In World War Two". There is a very brief introduction to the development of torpedo aircraft up to 1939, including that undertaken by other nations. From that point on, this book is a combat chronicle of Luftwaffe Torpedoflieger activities in all theatres. There is also appendices listing aircraft that carried torpedoes, the ships hit by German Torpedofleiger, a very short piece on the He 111 as a torpedo carrier, and some German and Allied documentation. For aircraft enthusiasts and modelers, who are the primary visitors at HyperScale, this book will be a bit of a disappointment. Regardless of what the title states, the focus of the book is not on aerial torpedo aircraft. Rather, the focus is on the operational claims of torpedo actions undertaken by the Luftwaffe. As to the aircraft themselves, there is merely a smattering of pictures and a few profiles. I would not call any of the pictures unique or surprising. If you have other books or monographs on the He 111 and Ju 88 / 188, then many of the pictures will not be new to you. I also find it odd as to his selection of pictures. While he does include a number of pictures of early torpedo aircraft, and aircraft with torpedoes for testing, there are no pictures of the Ju87 with the torpedo. There does exist a number of pictures of the test aircraft and one aircraft in what appears to be in a desert scheme or RLM 02 over 65. Yet, this is not included. Another disappointment is the absences of references or a bibliography. The author notes that the subject of the development of the torpedo has been covered elsewhere, but he fails to give any references or provide further information on where one could go to find out more about the subject. To me the title suggests a lost opportunity to provide an in-depth monograph on Luftwaffe aerial torpedo aircraft. This book also represents another entry into the questionable tile category of books, which also includes the Fw 190 in North Africa. While the titles may strongly imply a discussion of the aircraft, the real content is nothing more than a chronology of events. For the person who has access to these books only by mail order, disappointment at content and cost would be a real concern. This is not to say that this type of book does not have an audience who would be interested. For those who are interested in combat records and combat claims, then I would recommend this book to them. But even with that being said, I do wish publishers would be more forthright with book titles. It would have been better to be titled: “A Chronological Account of Luftwaffe Aerial Torpedo Operations”, such that one would not expect something like the Martin Pegg monograph on the Hs 129, even on a lesser scale.